The name of this Etsy shop is pretty misleading, as it's not exclusively clowns (if that's what you were hoping for. I'm a bit relieved, personally!) 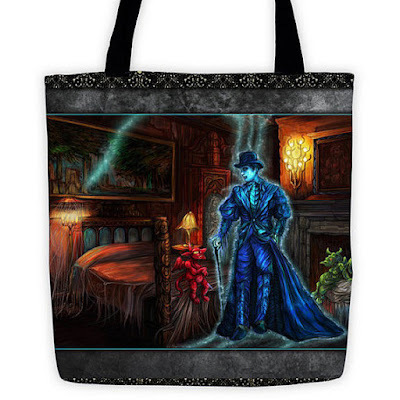 This store has a lot of cool totes that are great for trick or treating or just for shopping at the grocery store. Not only that, but they have cool throw pillows with their designs too! Clown Coffins on Etsy has a lot of cool stuff - come check it out! 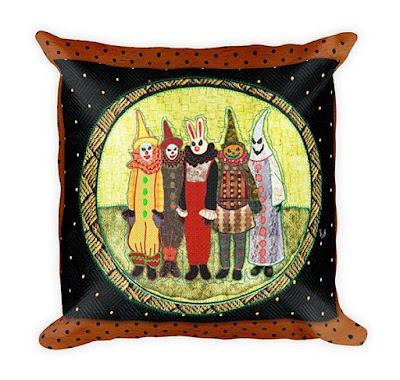 I have a soft spot for vintage items, so when I saw this Halloween decorative children in vintage style costume pillow I knew I needed it. If costumes looked like this still I would be definitely be scared on Halloween. I've never seen anything like this before. I think the art style of this priestess in a coffin is really unique and oddly alluring. Even with how vibrant the colors are, it's still fairly sinister. 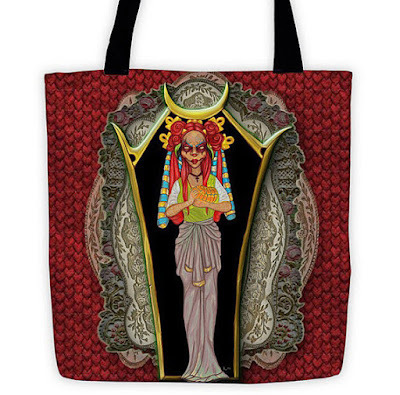 This is a beautiful piece and I'm glad it comes in both tote and pillow form. The Gothic bat girl looks like royalty. She looks like she may be hiding something devious in her hands. 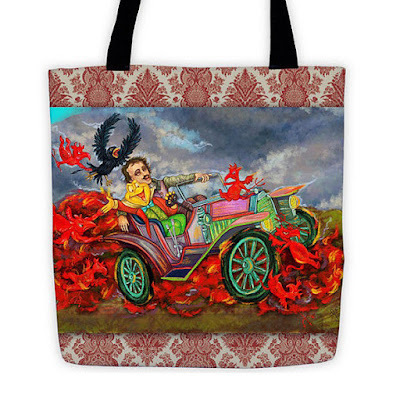 I want to take this Edgar Allan Poe vintage tote with me everywhere. I love the Raven and Devil lingering around Edgar as he's driving that retro car. 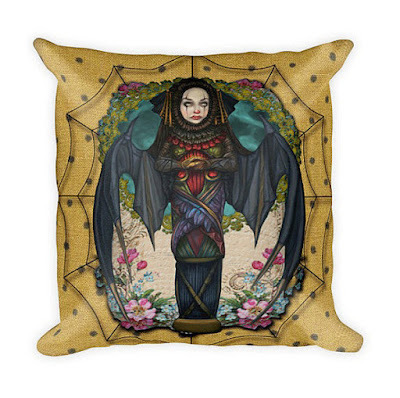 I'm not sure why this ghost in haunted mansion throw pillow shows him in a bedroom. I do like the decor, but I think I would have rather seen him in front of a grand Victorian spiral staircase. 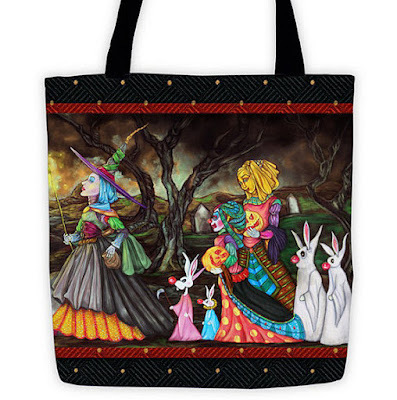 I love the trees in the background of the Halloween parade tote. They're so twisty and gnarly and look really frightening! The bright colors of their costumes almost offset the spooky background. 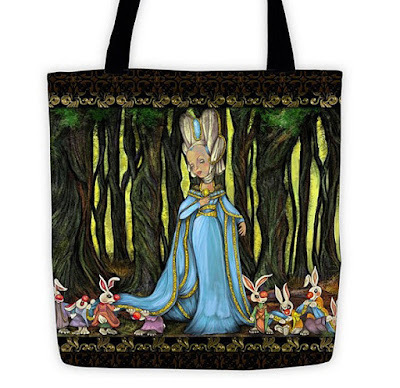 The Lady Cottontail tote is really interesting. It almost looks like something from Alice in Wonderland. Though, it's definitely Clown Coffins' own disturbing creation! 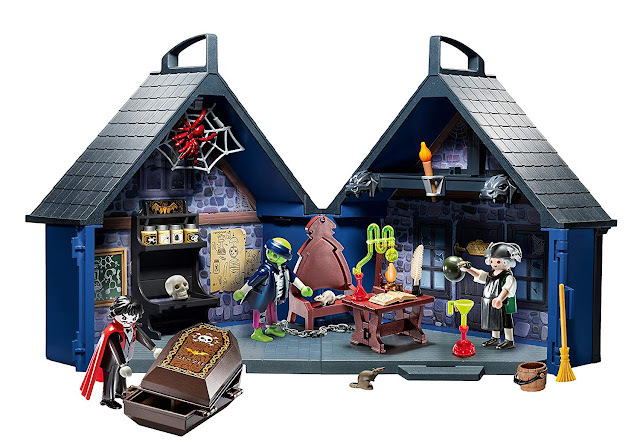 This is definitely more decorative than the rest. 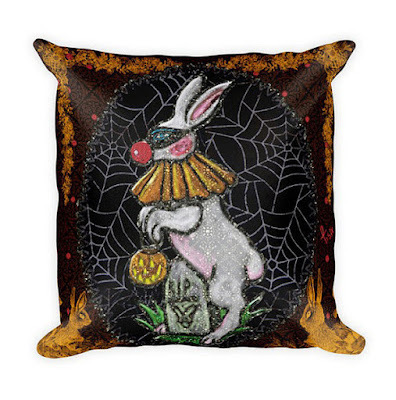 The Halloween bunny rabbit is wearing a creepy vintage clown outfit. These are the kinds of clowns that really freak me out. Aren't these really awesome, even though they are super colorful? 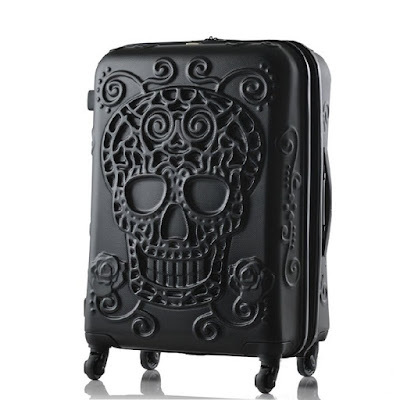 I think I would like to get a bunch of totes by Clown Coffins on Etsy. Especially for trick or treating - then I can get a bunch of candy. Or at least make the kids get it for me! Comment below and tell me what you think!